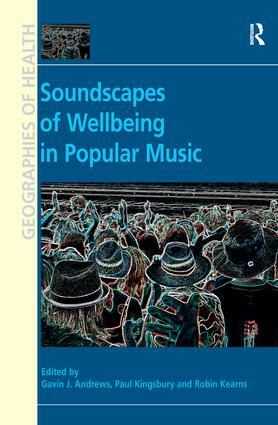 Unearthing the messy and sprawling interrelationships of place, wellbeing, and popular music, this book explores musical soundscapes of health, ranging from activism to international charity, to therapeutic treatments and how wellbeing is sought and attained in contexts of music. Drawing on critical social theories of the production, circulation, and consumption of popular music, the book gathers together diverse insights from geographers and musicologists. Popular music has become increasingly embedded in complex and often contradictory discourses of wellbeing. For instance, some new genres and sub-cultures of popular music are associated with violence, drug-use, and the angst of living, yet simultaneously define the hopes and dreams of millions of young people. At a service level, popular music is increasingly used as a therapeutic modality in holistic medicine, as well as in conventional health care and public health practice. The genre of popular music, then, is fundamental to human wellbeing as an active and central part of people’s emotional lives. By conceptually and empirically foregrounding place, this book demonstrates how - music whether from particular places, about particular places, or played in particular places ” is a crucial component of health and wellbeing. Gavin J. Andrews, McMaster University, Canada, Paul Kingsbury, Simon Fraser University, Canada and Robin Kearns, The University of Auckland, New Zealand.